We are delighted to announce CHIAROSCURO and tell you a bit about it. In 2014 Garry invited Baird Hersey to his studio to show him a new instrument that he had built. Two years later the result of that meeting is a new recording, Chiaroscuro. The album is a suite of pieces which combines ancient, traditional and innovative instruments and vocal techniques blended to create a sound never heard before. Baird is a composer and the leader of Prana, a group of harmonic singers with the ability to sing two pitches at once. That ability was the reason Garry had invited Baird to come hear his new instrument, the vistaphone. It is a four octave set of chimes that are tuned to the harmonic series, the same scale and tuning that harmonic singers use in producing their second, higher pitch. In Italian, Chiaroscuro means light-dark. It defines a style of painting that evolved in the mid 1600s which emphasized the contrast of darkness and illumination. 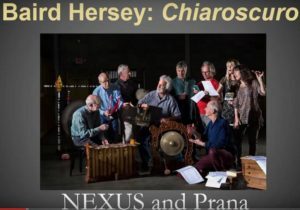 Hersey’s suite of pieces explores the juxtaposition and intersection of darkness and light in tuning, timbre and rhythm. There are four sections that use the etherial sound combination of harmonic singing, and the vistaphone. The three other interstitial sections counterbalance that quality with the earthly grounding of world and orchestral percussion supporting rhythmic, antiphonal and harmonic vocals. 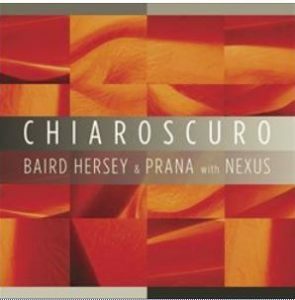 Baird Hersey is a National Endowment for the Arts Composition Fellow. The other members of Prana are Amy Fradon, Kirsti Gholson, Timothy Hill, and Bruce Milner. Each of them is a respected performers in their own right. Note: The 11th harmonic, featured prominently in Chiaroscuro, falls halfway between the 4th and the #4th scale tone of equal temperament. It is called the “crying” or “moaning” tone. More info available from Mark Gorney at Worldisc mark@worldisc.net (510) 665-4211. The album is available on iTunes by clicking HERE.